Take brown bread slices and apply butter on one side (if required). Set aside. In a non-stick frying pan, heat olive oil and sauté garlic and spring onions for two minutes. Add mushrooms and celery and stir-fry for two minutes. Add paprika powder, salt and black pepper powder and sauté for two to three minutes. Remove from heat and divide this filling into four portions. Put one portion of the filling on one side of a bread slice and spread it evenly. Sprinkle one tablespoon of grated cheese on top and cover it with a slice of buttered bread. Serve immediately. Similarly make the other remaining three sandwiches. Place a bread slice on a clean, dry surface, spread a portion of the stuffing evenly over it. Sandwich using another bread slice on it and press it lightly. Repeat with the remaining bread slices and stuffing to make 3 more sandwiches. Cut each sandwich in 2 equal pieces and serve immediately. 1. Heat a small non-stick pan, add the pinenuts or walnuts and toast them lightly on a slow flame, while stirring continuously. Keep aside. 2. When cool, combine all the ingredients together except the olives and blend in a mixer to a smooth paste. 3. Add the olives and mix well. 4. Divide the pesto into 4 equal portions and keep aside. 1. Trim the edges of the bread slices. Keep aside. 2. Place a bread slice on clean dry surface, spread a portion of the pesto evenly on it. 3. Place a cheese slice and ¼ cup of tomato slices evenly over it. 4. Sprinkle salt and pepper over it and sandwich with another slice of bread. 5. Repeat with the remaining ingredients to make 3 more sandwiches. 6. 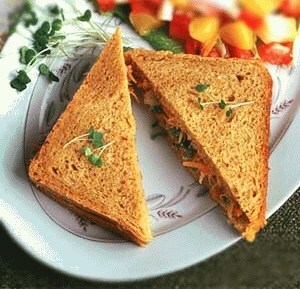 Cut each sandwich into 2 equal pieces and serve immediately. 1. Heat the oil in a pan, add the mushrooms and sauté until water has evaporated and mushrooms become dry. 2. Add the egg, green chillies, salt and pepper, mix well and sauté till the mushrooms are coated well with the egg and the mixture is cooked. 3. Remove from the flame, add the cheese and coriander, mix well and keep aside. 4. Spread the butter on 2 slices of bread. 5. Spread about 2 tablespoons of the mushroom mixture on one slice and cover with the other slice and grill using a sandwich maker or any other grilling method of your choice. Apples and carrots make a delicious sandwich combination. Cooking Time : : No cooking. Preparation Time : : 5 mins.